Even if you're a fan of the mighty Grand Theft Auto (GTA) franchise, you might be unaware that the original game's creators, DMA Design, once developed a not dissimilar free-roaming game for Nintendo entitled Body Harvest, but the plot hung on an alien invasion rather than thug life. We mention this only because GTA is such a hotchpotch of ideas and game styles that when considering what other games fans might like, the answer isn't necessarily clear cut. Here we've decided to look broadly at sandbox-style crime games, regular crime games, quirky offshoots and sandbox-style games without any crime. By the end, there should be something here for just about anyone. Unfortunately, the App Store isn't yet blessed with the original GTA or its sequel, but it does have the stupendously good Grand Theft Auto: Chinatown Wars (£6.99, iPhone; £6.99 iPad). Although viewed top down, the visuals are rendered in 3D with a rotatable camera, and the cel-shaded comicbook visuals give it a distinct look. The basic gameplay, revolving around the activities of the disgraced son of a murdered Triad boss, is classic GTA, but with some clever platform-specific tweaks. There are new minigames that take advantage of the touchscreen, and rather than just jumping into parked cars and driving off, you have to waggle a screwdriver in the ignition or hotwire the car. Brilliantly, you can even play your iTunes music over the car's 'radio' while driving around. Chinatown Wars is a must for GTA fans. For proper old-school GTA action, two perfectly playable games draw inspiration from the original. In Car Jack Streets (£1.99, iPhone) you play the part of Randall, whose gambling debts owed to a crime boss have to be paid off by stealing cars, bank heists and other crimes. It's colourful and fun - only the slightly awkward controls let it down a bit. If you fancy something similar but more gritty, Payback (£2.99, iPhone) is the way to go. It's not perfect, but it delivers a series of missions covering the gamut of criminal activity and the visuals have a pleasing depth. The story's disappointing, but if you need your criminal hit it's worth a look. 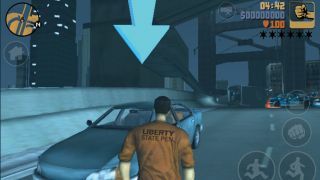 When GTA got really interesting, of course, was when it went all 3D and third-person in GTA 3, and it was with immense delight that we recently greeted the release of this iconic chapter of the series on our iOS devices. Grand Theft Auto 3 (£2.99, Universal) was an influential and controversial game, but it remains thoroughly entertaining. There are three Gameloft Gangstar games on the App Store. The earliest is Gangstar: West Coast Hustle (£2.99, iPhone; £2.99, iPad), which is a fair approximation of a GTA game. Although it's sandbox and you can explore the city, there's not a great deal of reward in doing so; stick to the missions. Gameloft's next iOS Gangstar outing, Gangstar: Miami Vindication (£4.99, iPhone; £4.99, iPad) is a less entertaining tale of a country boy who moves to the city to help his family. However, there are improvements over its predecessor: the visuals have received a fresh lick of paint, there are multiple vehicles to muck around in, there's a professional cast of voice actors and the game is just bigger. Last and probably least is Gangstar Rio: City of Saints (£4.99, Universal). All the ingredients for a good sandbox game are there, but it doesn't hang together well and feels like the series has run out of ideas. If your real-life criminal career is not working out and you're a bit skint, there are a couple of free-to-play apps that can give you the degenerate fix you crave. Urban Crime (Free, Universal) is a 'freemium' game from Gameloft that you can begin to explore free of charge, but that requires In-App Purchases if you wish to access all the features. Unfortunately, this particular title is pretty much Gameloft's previous title, Miami Vindication, with the exact same city and graphical assets therein, but with the single-player story missions stripped out. There's a different play mechanic, insofar as this is about gaining experience and taking over gang turf, but it's poorly executed and a fairly lazy attempt to repurpose the developer's own game. On the more casual side there's Crime City (Free, Universal). This is a cute and cartoony game with isometric visuals in which you simply visit various city locations committing crimes, garnering resources and building up your crime empire. Disposable fun. Sticking with the underworld, but with a slight departure from the sandbox genre, a couple of games focus on the vehicular side of things. Vertigo Rogue (£1.99, Universal) is a fun if frustrating shoot-'em-up, involving taking out rival gang members from a chopper. The control system is a handful, but it's good fun nevertheless. Driver (£1.99, iPhone) is a highly successful gaming franchise in its own right. This iOS port is deftly handled and despite the game showing its age slightly, it's rip-roaring fun. If all this criminality is causing you to lose faith in humanity, might we recommend a brief stint playing on the side of the law, in Gameloft's 9mm (£4.99, Universal). It's more like the game Max Payne than GTA, with the cop protagonist blindly leaping into life-threatening situations while the slo-mo set pieces allow you to relish every moment of the violent, if rather silly, action. It's far from perfect, but diverting enough. And finally… all this seediness, violence and generally uncouth behaviour has probably left a slightly bitter taste in your mouth, so why not clean the palette with a couple of sandbox games that deliver a similar style of gameplay, but in guilt-free fantasy settings. The first, is the massively multiplayer online role-playing game Order & Chaos Online (£4.99, Universal). How is it similar to GTA, you ask? In it, you wander around, killing evil beasties for money, exploring your environment, getting missions (or quests) from local residents, then heading off to do their bidding for powerful rewards and to become stronger, better and more influential. When it comes down to it, the concepts are almost the same. In a similar vein, but single player, try the basic-but-charming Ravensword: The Fallen King (£1.99, iPhone). Again, it's a 3D action adventure, set in a fantastical world, where you can hack and slash at enemies to your heart's content, safe in the knowledge they're only orcs and trolls and the like, and so don't really count as victims. Right?